A hand blender, also known as a stick blender or wand blender, is a kitchen blade grinder that is used to blend ingredients or puree food directly in the container that is being used for the food preparation. While very similar, a hand blender and an immersion blender are different. A blender is something that is able to turn things into liquid like when you are trying to make a milkshake or a smoothie. So, an immersion or stick blender would be the ideal choice for liquid recipes. A hand blender or mixer, on the other hand, is used to combine the ingredients and isn’t the ideal tool to use when looking to liquefy the ingredients. A mixer is best suited for batter and dough, such as you would see when making pies, bread, and cookies. They are similar devices, however, because they can both be easily held in one hand and they are both powerful and versatile kitchen tools. It is also easy to find a hand blender and immersion combo so you have all the characteristics of the two tools in one simple to use a handheld device. 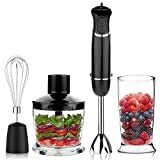 When you are looking to purchase the best hand blender, then you are first looking for something that will enable you to create easy, healthy, and family-friendly dishes at home without the hassle of having to pull out your bigger kitchen appliances to get the job done. Different brands offer different features and some have other determining factors to watch for including the overall wattage and power of the hand blender, the overall weight, how easy it is to use, clean, and maintain, and if it is safe to put in the dishwasher. It is important to pay attention to the weight because some can become extremely heavy to hold for longer amounts of time. There are also simple hand blender models that do not offer any additional features and instead are just a basic model with no additional attachments, accessories, or variable speeds. In terms of accessories that a handheld blender can come with, you will find whisks, choppers, and alternate blades. The whisk attachment is useful if you want to make cream or batter. The chopper acts as a mini food processor and can come in various cup sizes as determined by the manufacturer. Finally, the alternate blades can be changed to achieve different options, such as aerating, mincing, and chopping of ingredients. Shopping online for a new handheld blender is easy as long as you know what you are looking for and where to start. Amazon offers a wide range of hand blenders from various manufacturers and is the perfect beginning for your search. Hand blenders are economical, easy to use, and will prove to be a valuable asset to any kitchen environment. DeLonghi Hand Blender is a powerful device that allows for a more controlled blending experience and it features an easy-to-use design with a simple touch of a button and has a tri-blade design. All the parts are dishwasher safe which makes cleanup easy and it comes with many accessories including a chopper, whisk, and beaker attachments. Oster Hand Blender features two different blending speeds for a more versatile blending experience. It also has a stainless-steel S-blade design for improved durability and the hand blender comes with a measuring cup and blending cup. 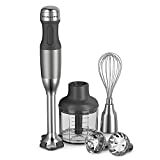 OXA 4-in-1 Hand Blender is one of Amazon’s best sellers and features two speeds and a turbo speed setting. It comes with accessories and attachments including a 500 ml food processor, whisk attachment, and splash guard. It offers a powerful 300 watts of power and can overcome any kitchen blending task with ease. Hamilton Beach 2-Speed Hand Blender makes a great addition to any kitchen with its powerful 225-watt motor, versatile capabilities, and dishwasher safe attachments. It allows you to whip, blend, mix, chop, and puree without having to utilize more than one bowl which makes the cleaning up process a lot easier. Proctor Silex Hand Blender features two different blending speeds and has an ergonomic handle for improved comfort and grip. It provides high-quality blending at an affordable price and is also ideal for soap making. It is a basic model that gets the job done quickly and successfully. KitchenAid 5-Speed Hand Blender features a removable blending arm that easily locks into the motor body and can be used for blending in deeper pots. It also comes with attachments and accessories to make it a more versatile device and the components are dishwasher safe. Braun Multiquick Hand Blender utilizes Power Bell technology and features stainless steel and durable blades and blending shaft that helps you achieve even better results in the kitchen. It comes with additional accessories and attachments including a beaker and a whisk attachment so you can do even more. It blends fast and enables you to achieve high-quality results. Cuisinart Smart Stick 2-Speed Hand Blender features two different speeds and a powerful 200-watt motor for all your blending needs. It comes in an assortment of different colors, as well including brushed chrome, metallic charcoal, metallic red, pink, red, sapphire, white, and white pearl, so you are sure to find one that fits nicely in with your kitchen décor. It is also easy to clean because it features a dishwasher-safe blending shaft and beaker. Epica 4-in-1 Immersion Hand Blender can handle frozen ingredients and has a powerful 350-watt motor that can tackle all your blending needs. It is a simple design with easy to use controls and one-click attachment release and allows multiple speeds for multitasking in the kitchen. It also allows for easy cleanup and storage when finished. It is a lot easier to find the perfect hand blender for all your heavy-duty kitchen tasks now because the majority of them are hand blenders and immersion blenders put together to create one very powerful and versatile kitchen appliance. It is no longer a requirement to have several different appliances for the tasks in your kitchen—they are now outfitted to take on different tasks such as chopping, mincing, pureeing, blending, and several of them are able to tackle frozen ingredients such as ice and frozen fruit. Depending on the features you are looking for, the price and the quality of the hand blender may go up. If you are looking for a more powerful motor, additional accessories, and improved attachments, then the price tag may be a bit higher. However, you are still able to find a simply designed and basic hand blender that can still do most everything you need in the kitchen. The extra-long cords are also a convenient feature because they allow you to be able to move more freely in the kitchen. Be mindful of the manufacturer’s warranty that may be available as well in case you have any issues with the hand blender. Most companies will offer replacement parts.